The Lugicum consists of (1) Upper Proterozoic graywackes and granodiorites (in Lusatia) and (2) mosaic of tectonostratigraphic domains (in West Sudetes), some of which became folded and metamorphosed before the deposition of Upper Devonian clastics and pelagic limestones, and Visean clastics (Culm). This recognition once led Bederke (1929) to emphasize a major role of Caledonian orogeny in the West Sudetes, with minor effect of Variscan deformations. 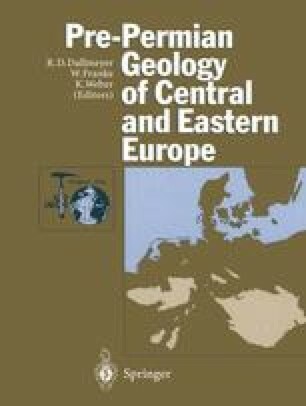 In view of much uncertain lithostratigraphy, some geologists doubted the presence of Caledonian events in the Sudetes and spoke about a continuous Caledono-Variscan cycle (Teisseyre H 1968a). The once vivid Barrandean syndrome of the Bohemian Massif geology assigned all metamorphosed rocks to the Precambrian until paleontologically proved otherwise, and resulted in ascribing most of the structure-forming events, prior to the Sudetic phase, to both early and late Cadomian (Assyntian) movements (Obere 1972, 1977; Zoubek 1988), or to late Caledonian ones (Bederke 1924; Kodym and Svoboda 1948).